This very private, family cottage blends in with the woodsy coastline of Vinalhaven Island and is almost imperceptible from the sea. Inside it has pine walls, high ceilings, large windows, skylights, and spectacular views of the ocean and surrounding uninhabited islands. It exudes a sense of spaciousness, and you will find that the large central granite fireplace gives out warmth and coziness in the evening. A dramatic deck, shaped like the prow of a ship, offers a perfect westward view into the sunset. This No Smoking cottage home was designed by the family and built on four levels of a hillside that slopes about seventy five feet down to 200 yards of ocean frontage. The lowest level is the sunken living room with a large granite fireplace, sofa, rocking chairs, a long bench under a large picture window, immensely high ceilings with skylights, and lots of cozy spots for reading, listening to music or playing games. The second level includes the kitchen with gas stove, large refrigerator, and natural pine counter-tops. The dining room opens directly out onto the deck. This level also includes a wood stove for extra warmth on chilly mornings, and a storage closet. The third level includes a full master bath with tub and shower, a washer and dryer closet, and a master bedroom with a comfortable king-size bed, three large closets, and a view of the sea. You can lie in bed in the morning and watch seagulls swooping after lobster boats in the bay. The fourth level is an enclosed loft bedroom with two extra-long twin beds, a closet, a full bath with shower, skylights, and a storage attic. Near the front door there is an outdoor shower for washing off salt water, and small deck for bikes and other equipment, as well as a small shop. The entire cottage is surrounded by a lovely rock garden with local plantings. Underneath the cottage there is an unfinished storage area that includes a large hot water heater and space for life jackets, paddles, oars, ladders, and boats. On the island there are many hiking and biking trails, an old lighthouse, a good library, a town playground, an excellent medical center, and a number of nature preserves. Around the point from our cottage there are unusual tidal falls, leading to a beautiful, protected salt-water lake (The Basin), filled with bird life and harbor seals. There are also a number of fresh water quarries on the island that are considerably warmer for swimming than the ocean. Off shore we are on the edge of a quiet bay encircled by eight to ten uninhabited small islands, ideal for picnicking and exploring. I live in Northampton, MA, where I am a retired family therapist, but I have spent summers in Vinalhaven throughout my whole life. I share ownership of our vacation house with my four adult sons and their families. This picture was taken while we were on a family picnic in the Basin. Our family first started summering in Vinalhaven in 1934. Quiet, fresh air, beautiful views, access to water. 1100 people live on Vinalhaven year round. The village is small and simple, and its primary industry is fishing. There is a view of the Camden Hill range over to the west on the mainland. 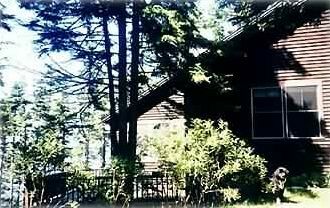 The cottage is set back 200 feet from the shore. Big open stone fireplace, and hardwood stacked on front porch. It's slow but it exists! Brand new kitchen, just renovated in 2018. In a bin under the window seat in the living room. Very simple with native plants only. We can't rent ours because of insurance issues, but you can bring your own. There is a golf course on the nearby island of North Haven.